ME 29 : Range 195 to 1000 nm with facility for automatic concentration. % transmission, absorbance & K Factor measurement. It has sample holder with 4-position selector control for 10 mm path length cuvettes. 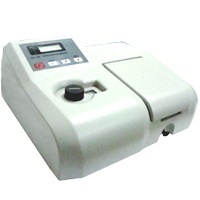 Facility has been provided for interface with any printer & RS 232 . Set of 2 quartz and 4 glass cuvettes is provided . Printer Interface Printer interface for any centronics dot matrix printer. Optics Complete mirror optics with resolution 1200 grooves/nm grating. Sample Holder 4 position adjustable sample holder.